32 gb micro sd card Class 10 suitable for the Cleverdog baby monitor / smart wifi camera. Recording for up to 7 days, including sound, The images can be viewed at any time of the day and from any location. 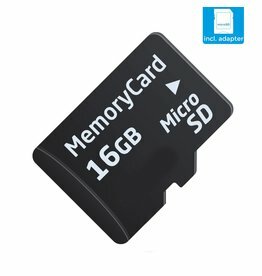 16 gb micro sd card Class 10 suitable for the Cleverdog baby monitor / smart wifi camera. Recording for up to 4 days, including sound, The images can be viewed at any time of the day and from any location.